Since you only get one bachelorette party, bridal shower, and wedding, you want to make it special. There's a lot of pressure on hosting the perfect bachelorette party, and that starts with the party materials lined up for you and your girls to enjoy. If you're ready to have a wedding party that is trendier (and more fun, let's be honest) than all the rest, then it's time to consider our 16-cup set She Said YAAAS! Bridal shower and bachelorette cups kit, fir for any wedding occasion. What Can You Expect with This Kit? 16-Cups: Provided with 16 cups, this is the biggest personalized bachelorette cup gift set you can find today. Metallic Gold Marker: Customize each and every cup to keep them sorted and completely unique to each woman. Money-Back Guarantee: Don't like the kit? We include a 30-day money-back guarantee! Why Should I Buy It? Reliable Party Investment: These bridal cups won't break, bend, or crack throughout night after night of partying and keep track of everyone's cups with the metallic gold marker. Customizable Options: Using our marker, customize each cup according to the girl's preferences. Trendy White/Gold Color Combo: Light up social media with our white/gold combo. Memories That Last a Lifetime: Make She Said YAAAS! memories you'll look back on years from now. CUSTOMIZABLE BACHELORETTE PARTY CUPS: Using our metallic gold marker included with these bachelorette party cups, customize each and every cup with a name for party fun and organization. Draw whatever you want on your bridal cup! 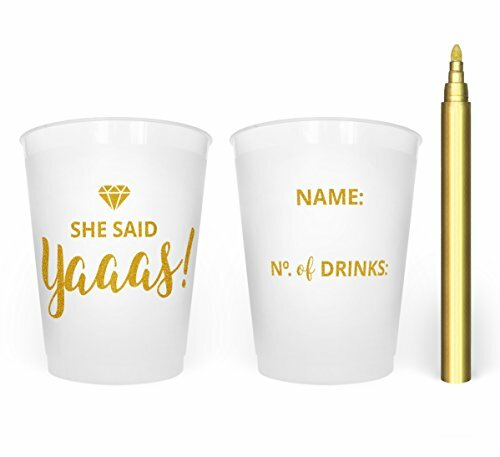 16-CUP SET: Rest assured everyone in your engagement party will have their very own She Said YAAAS! disposable bachelorette party cup. Save them afterwards and bring them home as a reminder of the memories made with your best friends. 16-CUP SET: Rest assured everyone in your engagement party will have their very own She Said YAAAS! disposable bachelorette party cup. Save them afterwards and bring them home as a reminder of the memories made with your best friends. DURABLE FROSTED CLEAR PLASTIC: Made from durable, reusable, and recycling plastic, these disposable bridal shower cups are flexible, yet strongly firm. They won't crack or crumble like the competition's plastic cups, and can be reused over and over again for all of your wedding parties. They are even dishwasher safe. TRENDIEST SUMMER GIFT: White and gold are the colors of 2018, which means your gold-marked She Said YAAAS! Bachelorette cups are going to be completely Instagram-worthy. Take our cups to the pool, on a party bus, to the casino, or out into the woods, providing you with cold, delicious beverages that you can drink with your sisters. 100% MONEY-BACK GUARANTEE: We're so confident in the performance of these frost flex plastic cups that we include a no-questions-asked 100% money-back guarantee if you aren't satisfied with the 16-cup set. If you have any questions about this product by Hott Mess Express, contact us by completing and submitting the form below. If you are looking for a specif part number, please include it with your message.